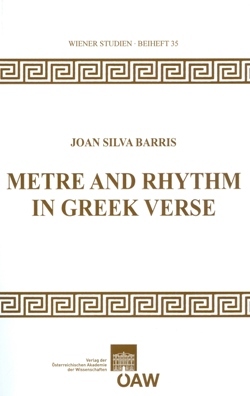 Metre and Rhythm in Greek Verse gives a general and comprehensive view of our up-to-date knowledge of ancient Greek song and recitation and goes further into the study of the different poetic genres and metrical-rhythmical phenomena. Unlike most of the previous research, it makes a combined use of all the sources available: metrical data, prosodic analysis, ancient works on rhythm and metrics, ancient musical documents and comparison with later musical tradition as well as with other cultures. The book provides new and interesting perspectives on the subject. It gives a broader framework to understand some metrical zeugmata and discovers new relations between syllables and rhythmical time-lengths. For some specific genres, the author goes over various possible analysis methods. In many other cases, he gives innovative arguments to support generally accepted interpretations or provides new evidence to defend traditional analyses which had been abandoned for decades. Metre and Rhythm in Greek Verse is a systematic and updated study on ancient Greek rhythm, a work which fills a gap in the reflourishing research on ancient Greek music.